In my parents backyard there is a tree, a tree that Jimmy loved to climb whenever we were visiting, a tree that he used to test his boundries, climbing so high on small and smaller branches, growing smaller himself with distance, scaring the wits out of me each time, grinning, laughing, pretending he couldn't hear me when I yelled up to him to come down, Jimmy, this minute! It's a lonely tree now, a tree that perhaps holds it's own memories and sorrow, a tree without a boy to climb within it's branches. 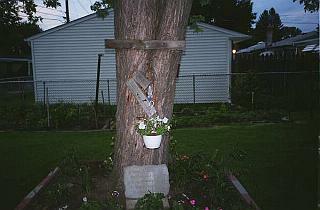 A tree that also grieves. 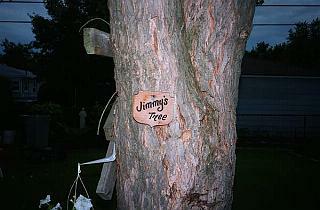 I know my Jimmy is in Heaven now. Everyone of us who knew and loved him cannot doubt that. But I think a part of his spirit still climbs the high branches of that tree. The part of his spirit that holds laughter. So, when I'm there in my parents yard, I try to find happiness too with my memories. It's not easy, but sometimes when I look up I can almost see him there smiling down at me. Sometimes I can smile back. And there is peace.